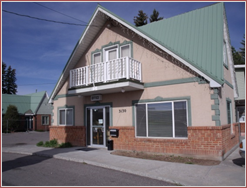 The Ruth House is a woman’s shelter of the Idaho Falls Rescue Mission which provides emergency, permanent and transitional housing services to adult females 18 years of age and older and women with children. The Ruth House provides a safe and sober environment for women who need to get re-established in the community. The Ruth House provides low cost housing in order for these women to have more time to save money, pay off debts and develop the skills needed for independent living. The Ruth House is a 24 room facility with over 50 beds available. The Ruth House provides 11 beds in our emergency shelter and 2 rooms designated for women with children specifically for those needing emergency housing services. Check in for the emergency shelter begins at 6:00 pm any night of the week. 1. Show proof of either a physical, mental or addiction disability. 2. Homeless for 12 months consecutively from the time of eligibility determination or has experienced at least 4 episodes of being homelessness within the last 3 years. The Ruth House provides 10 rooms and over 25 beds specifically for those needing transitional housing services. Two of these rooms are specifically designated for women with children. To qualify for temporary housing services females must demonstrate a need to live at the Ruth House in order to get re-established in the community. For current room rates please call (208) 522-1751. 2. Random drug and alcohol tests. 3. Residents will be assigned a case worker to assist the resident in receiving the needed services to enhance residential stability, increase job search skills/income and develop the skills needed for independent living. 4. Residents must demonstrate the ability to comply with the Ruth House policies in order to live at the Ruth House. Posting Comments below is for viewers on this website only. If you have information that can help users regarding Ruth House Women's Shelter Idaho Falls, please provide it below.